Meloche’s custom garden doors are available in 2 panels or 3 panels wide. The steel door has a 24 gauge steel face on both sides, with a continuous wood perimeter made of a solid wood lock block and is foam filled. 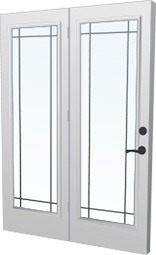 The Garden Door is available with clear, decorative glass or stylish grills. This door comes complete with hardware along with your choice of inside and outside colours.